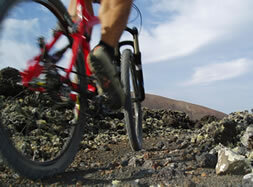 Tommy's Bikes Lanzarote - bicycle, mountainbike, roadbike rental and excursions on Lanzarote. 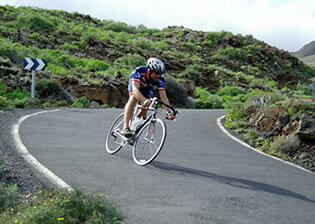 Welcome to Tommy's BIKES - the first bike rental and touring company on Lanzarote - since 1992. Cruising out of town on bike - nice and easy along the beachways to Arrecife/Puerto del Carmen (soon world's longest coastal-promenade). Touring to the César Manrique sights or other natural and cultural highlights of Lanzarote. Winding yourself up the roads into the north of Lanzarote or through the Timanfaya National Park on roadbike - always on track of the famous ironman-course. Mountainbiking on epic trails - up and down, between and around volcanoes. Joining us on one of our guided excursions - in small groups, with loads of views and interesting stories about Lanzarote - always adjusted to your skills and fitness. In our Bike Station in Costa Teguise we have best quality roadbikes and mountainbikes from international brands like TREK, Specialized, CUBE, FOCUS, BMC, Whyte, Cinelli, Cervelo, GIANT and SCOTT same as citybikes, hybrids, NEW: high-quality-e-bikes, tandem, kidsbikes in different sizes and childseats for hire. No matter riding mountainbike or racebike, whether cycling to keep fit or professional training for bikecompetitions or triathlons - everything is perfect on Lanzarote - and Tommys BIKES is your 1st adress for bike-rent and bike-tour.